Around a hundred passengers had to leave the plane they were on just before take off. Europe's largest regional airline has launched a campaign encouraging young girls to take on jobs as engineers and pilots. Airline Flybe, based in Exeter, has got into the April Fools Day spirit. In a quirky video they discuss a fictitious service that will be moving bees to parts of the country where they are lacking in number. It's fair to say that we're glad this was a joke. It wouldn't be great to be sat next to buzzing bees on a 4 hour flight. 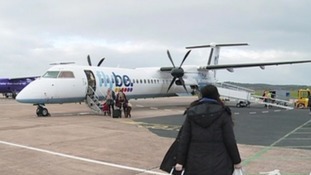 Flybe has cancelled all its scheduled flights from Exeter Airport this afternoon. 53 Flybe passengers including an infant survived virtually unscathed following the dramatic incident at Belfast International Airport. The Exeter-based firm said its drive to improve the reliability of its planes will see profits dive in the first half of the year.